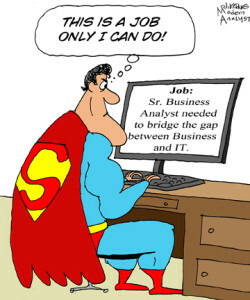 You are here: Home / IT careers / I am a Business Analyst! 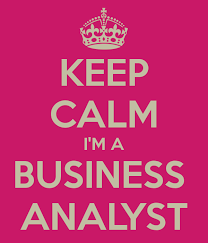 I am a Business Analyst! In my own head I know what I ‘do’ – and at the risk of getting all philosophically, I know what I ‘am’. I am a Business Analyst, a Bee-Ay, I work in IT, but I’m not very technical. My job is to translate business needs into computer systems, or better processes, or anything I’m asked to do really. No I can’t fix your computer. What is it you do again, something to do with requirements? You see my problem, the world of Business Analysis has a PR problem, part of a whole industry (IT) that has a PR problem. I have spent my whole career trying to explain what I do. Even this week 2 fellow IT professionals (no names no pack-drill) seemed confused…one thought I did something with statistics or data, another thought I was a systems analyst, which is a whole different thing! To try to explain, in lieu of an escalator speech, here is my list of “do’s” and “don’ts”. We understand, document and analyse requirements, except on Agile projects where there are no requirements! We are experts in a company’s business but are not Subject Matter Experts. We are excellent communicators, empathisers, problem-solvers, conflict-resolvers, politicians, critical thinkers, team players, and self-starting, self-motivated individuals. We are independent, except when we are a champion or a stakeholder. We can be generalists or specialists. We are strategic big picture blue sky thinkers with a methodical mindset and a good attention to detail. We can work on projects or be part of a business unit, or both (matrix) or neither. We can be permanent or freelance. We are the bridge between the business and IT. We make a difference! We don’t manage projects, design, code or test, except when we are called on to do all these things! 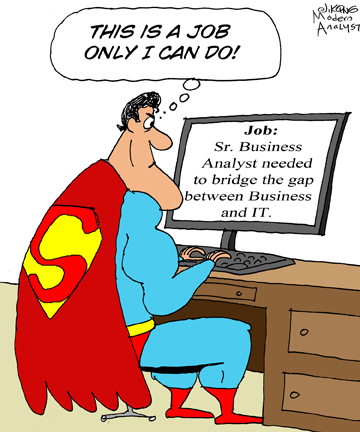 There is a longer definition of the role of a Business Analyst in the Table of IT Elements. As always thank you for your questions, feedback and comments.